The software allows you customize your own Ribbon in Microsoft Office 2007. It also shows Classic Menus and Toolbars on the Ribbon of Microsoft Office 2007. All new features of Office 2007 have been added into the software. Supports all languages that are supported by Microsoft Office 2007.Supports all languages that are supported by Microsoft Office 2007 including: English, French, German, Italian, Spanish, Portuguese, Japanese, Dutch, Chinese. Quickly search and add any controls. You could customize and change ribbon style of all of Office 2007 Suites: Basic, Standard, Home and Student, Small Business, Professional, Professional Plus, Enterprise and Ultimate. 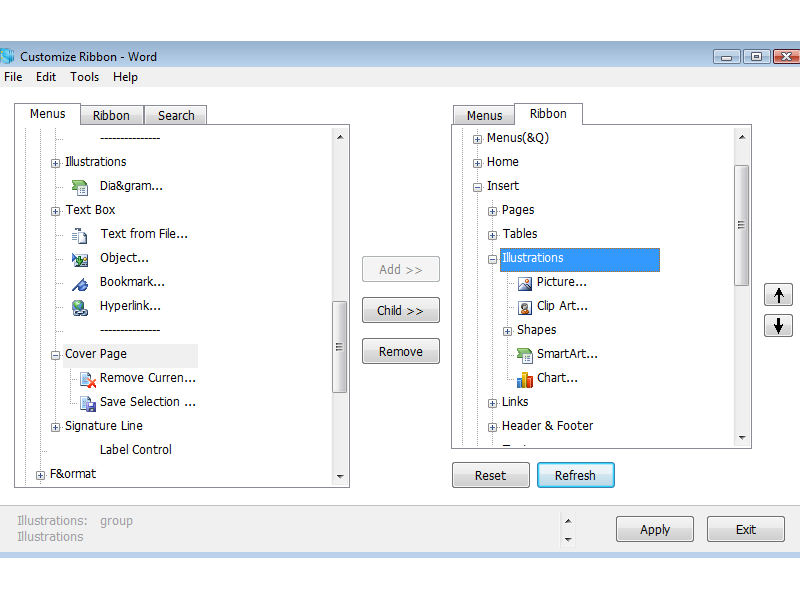 Ribbon Customizer for Office 2007 is very easy to deploy the software to all client computers in your Enterprise or Organization.Free download and trial. Free updates and supports for 2 years, use forever and 60-Day Money Back Guarantee. Qweas is providing links to Ribbon Customizer for Office 2007 4.10 as a courtesy, and makes no representations regarding Ribbon Customizer for Office 2007 or any other applications or any information related thereto. Any questions, complaints or claims regarding this application Ribbon Customizer for Office 2007 4.10 must be directed to the appropriate software vendor. You may click the publisher link of Ribbon Customizer for Office 2007 on the top of this page to get more details about the vendor.